(standing, left to right) Dr. Newell, Mr. Walter, Dr. Kirk, (seated) Mr. Jordan. On February 7, 2011, Dr. Allan Kirk and Dr. Kenneth Newell's surgical teams successfully completed a living donor kidney transplant from the head baseball coach at Wake Forest University to one of his players. A human-interest story of the highest order, news of the surgery was reported in approximately 480 media outlets across the world, from the New York Times to the Times of India to the Toronto Star to Reuters-UK to Philippine Talks-Manila to many, many more. Freshman Kevin Jordan was recruited by head coach Tom Walter to attend Wake Forest University following his graduation from Northside-Columbus High School in Columbus, GA, in Spring 2010. Mr. Jordan began to feel ill in January 2010 and was diagnosed with ANCA vasculitis, a type of autoimmune swelling caused by auto-antibodies. While normal antibodies are produced by the immune system to fight germs, auto-antibodies attack one's own cells and tissues, often leading to kidney failure. As the disease worsened and he underwent daily dialysis, Mr. Jordan was limited in his ability to take part in fall practice at Wake Forest. Because of the progression of the disease, he did not return to school for the 2011 spring semester. When doctors tested members of Mr. Jordan's family and did not find an ideal match, Coach Walter decided to undergo testing and was found to be a good match. Assured that he could resume a normal lifestyle and aware that Mr. Jordan could languish on a national donor list for up to five years, Coach Walter said he never thought twice about volunteering. "I didn't ask (him)," said Mr. Jordan at a press conference held two days after the actual procedure (watch the video). "He volunteered. I'm just really thankful." Coach Walter said that his motivation was not getting Mr. Jordan back as a player, but giving him "a chance to be a college freshman." Dr. Newell, who procured Coach Walter's kidney, and Dr. Kirk, who transplanted it into Mr. Jordan, said that medical advances have increased the success rate of matches and transplants. A recipient, Dr. Kirk said, "receives an extra 10 years of life" over a dialysis patient. "Kevin should live a life that is normal in activity and normal in length," he said. Forecasting Coach Walters' post-procedure outlook, Dr. Newell said: "Based on thousands of transplants, the expectation is that a year from now or 20 or 40 years from now he's not going to feel any different than he would have otherwise." Although kidney transplant patients require specialized medications to maintain the function of their kidney, medications can be tailored to allow patients to return to normal activities, including high-level athletic performance. As such, it is anticipated that Mr. Jordan will be able to return to competition for the 2012 season. Emory transplant surgeons are actively involved in the development of new transplant medications and in the adjustment of existing medications to minimize their side effects. 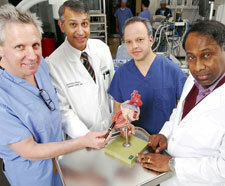 (left to right) Apica Cardiovascular co-founders James Green, Vinod Thourani, Jorge Jimenez and Ajit Yoganathan point to the location on a heart model where their heart surgery system attaches. Apica Cardiovascular was established in 2009 as a medical device start-up and partnership between the Georgia Institute of Technology and the Emory University School of Medicine. The company’s founders are Vinod Thourani, MD, Associate Director of Emory's Structural Heart Program; the Georgia Institute of Technology’s Jorge Jimenez, PhD, and Ajit Yoganathan, PhD, the Wallace H. Coulter Distinguished Faculty Chair in Biomedical Engineering; and company CEO James Green. Apica recently received a sizable corporate investment in its first project, a system that simplifies and standardizes the technique for opening and closing the beating heart during cardiac surgery. The company has also been chosen as “Emory University’s Start-up Company of 2010” by Emory’s Office of Technology Transfer (OTT). Designed by Drs. Thourani, Yoganathan and Jimenez with the intent of minimizing bleeding of the left ventricular apex, the new device consists of a conduit that allows it to be securely attached to the beating heart. Surgeons can then deliver therapeutic devices, such as heart valves or left ventricular assist devices, into the beating heart without loss of blood or exposure to air. Once a therapeutic device has been delivered and surgery is complete, the system closes and seals the access site with an implant, eliminating the need for sutures. A series of pre-clinical studies testing the functionality of the device have been completed, with further product development and European regulatory approval being the next step. In early February, OTT informed the company that it had been chosen as the central honoree at its annual “Celebration of Technology and Innovation.” The awards ceremony will be at the Emory Conference Center on March 10. Over the past two decades, Emory has launched 51 start-up companies through OTT and uses any funds received from the start-up companies’ technology transfer successes for a variety of programs in research and science education. According to "Axillary Dissection vs. No Axillary Dissection in Women with Invasive Breast Cancer and Sentinel Node Metastasis," a new study published in the February edition of Journal of the American Medical Association, the standard practice of removing cancerous nodes, a painful measure that can cause complications, does not improve survival or prevent cancer recurrence for about 20 percent of breast cancer patients. In an editorial accompanying the study entitled "Management of Axillary Lymph Node Metastasis in Breast Cancer: Making Progress," Dr. Grant Carlson and Dr. William Wood called the study an "important contribution" that represents the latest development in breast cancer treatment, which has steadily been moving toward less-aggressive options, sparing women from unnecessary surgery and follow-up therapy. For the study, lead author Dr. Armando Giuliano (chief of surgical oncology at Saint John's Health Center in Santa Monica) and his colleagues analyzed data collected from 445 women who had their nodes removed and 446 who did not. Of course, all had radiation and chemotherapy. The researchers found no significant difference in the patients' chances of surviving five years after their diagnosis, with those who did not have the more aggressive surgery having a five-year disease-free survival rate of 83.9 percent compared to an 82.2 percent rate in those who did. The researchers concluded that removing cancerous lymph nodes was unnecessary because chemotherapy and radiation had the ability to wipe out any disease in the nodes. "Women with breast cancer have benefited greatly from a series of carefully performed randomized controlled trials," Drs. Carlson and Wood wrote, "that have shown that less surgery combined with more radiation and chemotherapy have improved survival for women with breast cancer." Further more, they wrote, the study provides "strong evidence that patients undergoing partial mastectomy, whole-breast irradiation, and systemic therapy for early breast cancer with microscopic SLN (sentinel lymph node) metastasis can be treated effectively and safely without ALND (axillary lymph node dissection)." Experts predict that the new findings, combined with similar ones from earlier studies, should change medical practice for many patients. For example, Dr. Gary Lyman of the American Society of Clinical Oncology has stated that the group will probably be prompted to revise its recommendations for breast cancer patients accordingly. The guidelines are currently under review. The American College of Critical Care Medicine named Dr. Timothy Buchman to receive the Distinguished Investigator Award — a prestigious honor which recognizes clinical researchers for meritorious and pioneering work in critical care and significantly contributing to the understanding of disease and treatment of critically ill and injured patients. 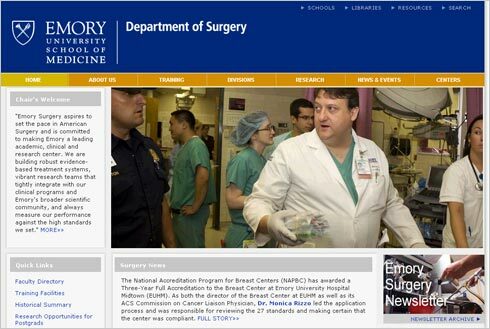 As the founding Director of the Emory Center for Critical Care (ECCC), Emory's newest comprehensive center of excellence, Dr. Buchman is integrating ICUs throughout the Emory Healthcare system, bringing together clinicians and investigators from diverse disciplines to conduct research to define best clinical practices and inform public health policy. The center also houses Emory's training programs in critical care anesthesiology, surgical critical care, and pulmonary/medical critical care. 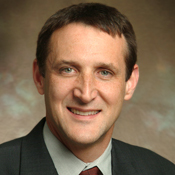 Dr. Craig Coopersmith, Associate Director of the ECCC, has been invited to join the Surgery, Anesthesiology and Trauma Study Section (SAT), Center for Scientific Review, of the NIH from July 1, 2011, to June 20, 2015. SAT reviews applications examining the complementary disciplines of surgery and anesthesiology, traumatic and acute injury, and surgical critical care. Sepsis and injury studies reviewed by SAT often address the host response to such complex insults as trauma, severe infection, or surgical stress, with a general focus on metabolic, hormonal, cellular or immune responses of the host to these various insults. SAT also reviews applications examining the basis of interventions including mechanisms of anesthesia/analgesia, wound repair, organ recovery and cellular and immunological therapies. Dr. Sheryl Gabram was appointed as a reviewer for cancer research funding awards by the Georgia Cancer Coalition (GCC). The GCC’s awards are granted to scientists in Georgia and funded through a state income-tax check-off program, allowing Georgians to elect to donate $1 of their state income tax bill to fund cancer research. Priority is given to new-to-the-field investigators who use research results to develop and secure national peer-reviewed funding; proposals that link engineering to the biomedical sciences; and established investigators who have an innovative idea of a translational nature, which requires seed funding to achieve proof-of-principle leading to an application for peer-reviewed funding. In 2008, Dr. Gabram herself was named a GCC Distinguished Cancer Clinician and Scientist and received a five-year grant. Dr. David Lefer, Director of the Cardiothoracic Research Laboratory at Carlyle Fraser Heart Center, was named recipient of the Benedict Lucchesi Award in Cardiac Pharmacology of the American Society for Pharmacology and Experimental Therapeutics. Dr. Lefer was selected in recognition of his scientific leadership in the field of ischemia/reperfusion and cardio-protection and his commitment to mentoring the next generation of cardiovascular scientists. Known for conducting progressive research that has vast potential for treating patients with coronary artery disease, Dr. Lefer is an internationally regarded leader in investigating the role of nitric oxide and other nitrogen oxide-metabolites in ischemia-reperfusion injury to the heart. Recently, his laboratory discovered the cardio-protective actions of hydrogen sulfide when applied to acute myocardial ischemia-reperfusion injury and heart failure. Dr. Grace Rozycki was appointed President of the Southeastern Surgical Congress at the organization's 2011 Annual Scientific Meeting, February 12-15, in Chattanooga, TN. Organized in 1930, the SSC is the largest regional surgical society in the United States. Dr. Rozycki was also selected to receive a Raising our Voices: Women Leaders in Medicine Award given by the American Medical Student Association. She and four other awardees will be honored at a gala reception on March 12, a centerpiece event of the AMSA's 61st Annual Convention in Washington, DC. The award recognizes women physicians and educators who serve as role models, mentors, highly accomplished professionals, and sources of inspiration for women who are currently in their medical training. Nominations are solicited from medical students across the country. At the 24th Annual Scientific Assembly of the Eastern Association for Surgery of Trauma (EAST) in January, Dr. Jeffrey Salomone was appointed President-Elect. He has served as Recorder on EAST's Board of Directors since 2007, a position that included the responsibility of chairing the Program Committee. Having more than 1000 active members, EAST seeks to improve care of the injured by providing a forum for the exchange of knowledge in the practice of trauma surgery; to promote trauma prevention, research, and improved trauma systems design; to encourage investigation and teaching of the methods of preventing and treating trauma; and to prepare young surgeons to become leaders. Faculty and residents of the Department of Surgery are invited to attend the J.D. Martin Reception on Wednesday, March 16, 2011, 6:00-9:00pm, at the Carlos Museum. 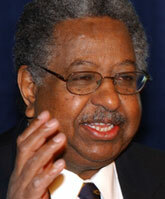 In attendance will be visiting professor Haile Debas, MD, who will be delivering the 35th Annual J.D. 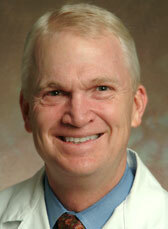 Martin Lecture the following morning at Surgical Grand Rounds, entitled "Surgery in a Globalized 21st Century." Please RSVP by February 28 to surgeryeventsrsvp@emoryhealthcare.org. 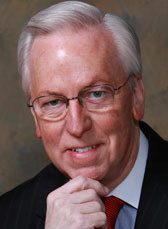 From the University of California in San Francisco, Dr. Debas is Senior Global Health Advisor; Founding Executive Director, Global Health Sciences; Director, UC Global Health Institute; Maurice Galante Distinguished Professor of Surgery; Dean Emeritus, School of Medicine; Vice Chancellor Emeritus, Medical Affairs; and Chancellor Emeritus. Emory Surgery will also be hosting a cocktail reception at the American College of Surgeons 97th Annual Clinical Congress, October 23-27, 2011, in San Francisco. The date and time of the reception have yet to be confirmed, though either the 25th or 26th have been requested. Once the date has been determined it will be announced via invitations and future issues of this newsletter. Emory Surgery faculty & residents are invited. A quarterly review and analysis of surgical services performance among Anesthesia, Surgery and OR Staff of Emory University Hospital. Attendance by invitation only.